Born before the arrival of the humble telephone, Sir Joseph Whitworth founded a scholarship for ex-apprentices to attend university and gain a theoretical education to bolster their practical experience. Now, 150 years later, the Whitworth Society (founded in 1923) has commissioned interviews with eminent Scholars from across the engineering spectrum. On this page you can explore the lives of these Scholars and hear their stories in the short podcasts that have been recorded. The interviews were conducted at the IMechE library in Westminster, London and over Skype. We hope these will inform and inspire the next generation of engineers and potential Whitworth Scholars. We encourage you to share these #Whitworth150 stories on social media. For Monika Sud, discovering the Whitworth Scholarship brought a sense of belonging. A student at the time, she knew of only one other person in her year that had taken the apprenticeship route into university. "I was amazed that there was a scholarship out there for people who had taken a different path," she says. "It was a great way to join something, where I would find others like me." At university, Sud discovered she had a different set of skills to her peers, who had travelled along academic channels. She excelled at hands-on tasks and project management. In 2005, Sud left England to live in Australia, where she is now a senior associate in a management consulting firm, which handles giant infrastructure projects. She says the Whitworth Scholarship helped her build her career. It helped fund her studies and opened up a whole new network. "I met engineers from across all levels of the industry," she says. For Sud, some of the great global challenges for engineers include climate change and population growth, which puts strain on food and water supplies. In her line of work, engineers are trying to find ways to integrate autonomous vehicles into the available infrastructure. To find solutions to these problems requires different and creative thinking. Sud says she is pleased to see engineering opening up and becoming more diverse. "I see more females entering engineering, which is great," she says. "There's lots more diversity. Here in Australia, we've got all different races, including Aboriginal and Torres Strait Islanders, coming into the career, which has been fabulous to see." Sud may find herself 10,000 miles away from where she studied and received her Whitworth medal, but she says she is immensely proud to carry the Whitworth name with her, wherever she goes. "My message (to those considering the scholarship) is: it's definitely worth applying. It's a prestigious award, if you're successful," she says. "It has really lifted my career... and I am proud to have the words 'Whitworth Scholar' on my business card." Gill Cooke was applying for a new job at an aerospace company when the manager interviewing her brought up her Whitworth Scholarship. She had finished her apprenticeship, qualified as an engineer and had no idea of the door her recently-obtained Whitworth medal was about to open. "The managing director actually said to me that it was the scholarship that made the difference," Cooke recalls, explaining how she was hired. "His professor at Cambridge had been a Whitworth Scholar had been more proud of that than his PhD and his research." Later in life, being a Whitworth Scholar would help make important connections as Cooke secured consulting work, before moving into academia. "It helps you stand out," she says. "To be different. To add something that others don't have. More informally, it's the network, the society and being part of a group of like-minded people who are there if you need them." Professor Cooke, who is now head of teaching at the engineering school at The University of Warwick, is responsible for every aspect of what she calls the "student journey". With a background in quality engineering and machine tools, she feels a strong connection to Sir Joseph Whitworth's work in the field of standardisation and precision measurement. But for her, Whitworth's legacy stretches beyond his "technical creations" to the scholarship he founded in 1868, which continues 150 years later. She is a past president of the Whitworth Society, which supports scholars. "Engineers have a duty to contribute to a better world. For me, the most important thing is that we have the best engineers. Doesn't matter whether they are male or female, what their country of origin is, or what their political and religious beliefs are. To solve societal problems, we need the very best engineers. We should all be treated with dignity and respect." Cooke thinks that were he alive today, Sir Joseph would look at modern technology and think of ways it could make an impact in the future. He would be "looking for opportunities", she reckons. To those weighing up a career in engineering or applying for the scholarship, Cooke has this to say: "Engineering is the most worthwhile and rewarding career you can follow. It has the potential to impact many, many people in a positive way. It's not an easy route. It's a hard qualification to get. But that's what makes it valuable. So hold on to your dreams, work hard and go for it!" Ben Hughes left school at 16 with a bad attitude and a chip on his shoulder. A four-year engineering apprenticeship at Shell UK sorted out the bad attitude, he says, the chip fell off and before long he was craving to do more with his life. Working nearly 50 hours a week and studying part time, he obtained the engineering degree he wanted. Hughes was ready to go further, but it was not until he stumbled across the Whitworth Scholarship that he was able to quit work and focus on obtaining his PhD. Today, Dr Ben Hughes is a trailblazer in the energy sector, a reader at Sheffield University and one of the brains behind innovative global projects, including the construction of air-conditioned stadiums in Qatar. He says the Whitworth Scholarship gave him the confidence he needed. "The most important thing is the network of contacts within the Whitworth Society," he explains. "There's a network of people who have been on the same journey. You can pick up the phone and get some advice. They can phone you, and you can help each other. It makes a big difference." Hughes has worked in Dubai and runs a research company linked to his university. The money generated through the company's products - such as low-energy cooling wind towers - is channeled back into the university, allowing for more PhDs to be awarded and for further research to be undertaken into things like smart homes and buildings. For Hughes, what makes the Whitworth Scholarship unique is that it's designed for people who take a different route into academia. However they get there, he says, they can help engineer solutions to some of the world's most urgent problems, such as climate change, food security and the depletion of energy resources. Hughes believes pioneers like Sir Joseph Whitworth, who founded the scholarship 150 years ago, come once in a generation. He thinks that if Whitworth lived in this era, he would still be at the forefront of advancing manufacturing. "I am sure there are many people looking at scholarships, looking at the lists of scholars and being put off, thinking they are not at that level," Hughes says. "But the reality is that if you were at that level, you wouldn't need the scholarship. So apply. Come speak to us. We can help. Just believe in yourself. Have no fear." Rachael Hoyle believes legendary toolmaker, Sir Joseph Whitworth, used his core skills to make the world a better place. Modern day engineers, she says, should aspire to do the same. Hoyle, a scholar since 2013, did her apprenticeship at BAE Systems and decided to study further because she craved knowledge about the engineering industry. The firm supported her and, over the years, she has used her background in mechanical engineering to move into a project management role at the company. When Hoyle discovered the Whitworth Scholarship she felt inspired by Sir Joseph's life. She saw him as someone who may have been an "abrupt and direct character", but also a man whose intentions were always to advance engineering. In her eyes, Whitworth had the right idea: to merge the spheres of practical experience and theoretical learning. "Having an understanding of the practicalities of how engineering works, and then to be able to apply the theory in an academic approach, gives a different perspective to problem solving," she says. "Diversifying how we solve problems can only give us better solutions in the long run." Hoyle says obtaining her Whitworth Scholarship had a "massive impact" on her life. It introduced her to a wide group of people who share core values and who want to see progress in the industry. "It opened my eyes to a world beyond North West England," she says. Looking at the wider engineering sector, Hoyle sees perceptions changing. No longer is being an engineer considered "dirty work", she feels, but rather an "intellectual challenge". With more diverse role models emerging, diversity will also continue to flourish. She thinks Whitworth would likely be overwhelmed by the progress made over the past 150 years, if he could somehow see it. "I would hope he would be impressed... but we can always do better." Hoyle encourages others to apply for the Whitworth Scholarship. "It's a great opportunity," she concludes. "It brings different kinds of people into the industry. So it's what you make of it. You get out of it what you put into it." Michael Wood has been a Whitworth Scholar twice as long as Rikki Jones has been alive. Wood was awarded his Whitworth medal not long after the Second World War. Jones received his 63 years later, in 2016. The two men represent the depth and range of the Whitworth network, which both scholars consider to be incredibly valuable. Wood is retired now, but spent most of his 90 years teaching at Cambridge University. He jokes that he only "gave up" because the undergraduate students became "far too clever". As a past president of the Whitworth Society, he believes the scholarship is special. "The programme combines practical experience in workshops with intellectual education in engineering," Wood says. "It's the combination of the two, which makes for really good engineers." Jones is the kind of engineer Wood has in mind. Having started out as an apprentice, Jones is now a principle engineer at Babcock, a global company with 35,000 employees. The 30-year-old says he pursued his degree and the Whitworth Scholarship because of a hunger to know more about his industry. "The greatest thing is the network of great engineers, right across the industry, that I now have access to," says Jones. "We all share common interests and are all very passionate about what we do. There is always someone you can speak to." Jones is proud to be an engineer. For as long as he can remember, he has been ripping things apart to see what makes them work. He loves it when his 9-year-old nephew runs up to him and asks: "Can you fix this, uncle Rikki?" To which Jones usually replies: "You know I can. I can fix anything." Jones sees the skills gap as a major challenge for the engineering industry. Wood says it's about showing young people the benefits of apprenticeships. He says those without hands-on experience can sometimes find themselves "lost at sea" in university lectures. Wood says the major change he has observed in engineering is a steady rise in the percentage of young people who study at universities. He thinks that if Sir Joseph Whitworth were alive today, he would be "enormously excited" by things like 3D modelling and printing, exploring their potential across industries. Jones reckons Whitworth would feel a great sense of pride but would continue to urge engineers to push boundaries. One way, he says, would be to apply for a Whitworth scholarship. "Go for it. It's a unique experience," says Jones. "It's taken me to some great places. I've met some great people. It adds another element to your life as an engineer. Grab it with both hands!" To illustrate the power of the Whitworth network, Howard Stone likes to tell the Albuquerque story. It begins in 1999, the year Stone embarked on his Whitworth Scholarship journey. He was at an industry event in London when he met a man named Alan Ross, who had just received his Whitworth medal. The pair spoke for 10 or 15 minutes. Six years later, Stone secured some work in New Mexico, America. "I worked in Albuquerque for a year and a half and, would you believe, there's a scholar who lived in Albuquerque. I emailed him out of the blue, said: "I'm coming over, are you free to meet me?" I went out there, Alan and his wife took me around, my family moved out there with me and every Saturday we all went out for breakfast on old Route 66". Stone, the current president of the Whitworth Society, says the scholarship also opened a door for him to a nine-month project in Dubai. As someone who came across the programme by spotting a poster on a college wall, he could never have imagined the value it would bring to his life. Stone says Whitworth Scholars are leading in every sphere of engineering. Some are recent graduates, others are professors or senior researchers. There are leaders of industry and business owners. The work they are involved in ranges from building giant infrastructure, like roads or bridges, to researching the resistance an embryo encounters in the fallopian tube. "We have some amazing people inside the society," Stone says proudly. Like Sir Joseph Whitworth, Stone left school early to become an apprentice. Later, he studied his way through a mechanical engineering degree, a doctorate and an MBA. Now a business owner and consultant, he admires the ability Whitworth had to make tough decisions and find practical solutions to problems. Another story Stone enjoys telling is the one about how Whitworth (inventor of the Whitworth Rifle) managed to plot the trajectory of a rifle bullet back in the 19th century. "You don't have high speed cameras, you don't have the laser techniques we have today," Stone explains. "Being a Victorian, he built a shooting range in his back garden, put a piece of paper every 10 yards, fired the gun and then put the pieces of paper together again to measure the hole and how the trajectory of the bullet went. You can have a huge impact on how guns work all over the world just by doing one simple test." To engineers considering applying for the Whitworth Scholarship, Stone gives the same advice he dishes out to his three young daughters. "I've been fortunate to get scholarships from multiple places because I've gone out and found them, not because they came to me," he says. "You are only limited by your own imagination." Pav Bhogal is a 25-year-old engineer who received his Whitworth medal less than a year ago, but already, he's thinking about the next generations. Working in the naval ships division at BAE Systems, Bhogal helps students with difficult backgrounds or those from ethnic minorities to enter engineering. Teaming up with other organisations, including schools and universities, he's helping them compile CVs, prepare for interviews and learn how to present themselves to potential employers. "One of the biggest problems is the skills gap and trying to recruit and retain enough engineers," Bhogal says. 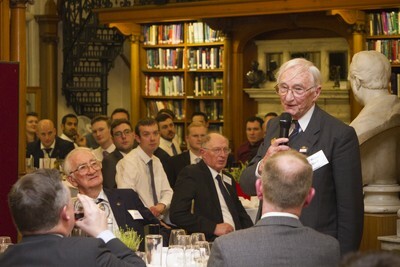 "There is a very real issue with an ageing population of engineers. In the next five to 10 years, a lot of engineers we know and love, and who do a lot of our work, will be retiring or leaving. There's a gap between that generation and the groups coming in now. So it's about being able to transfer and retain knowledge." Bhogal says he expects to see major changes in the future, including a "huge increase" of women in engineering. Getting the Whitworth Scholarship allowed Bhogal, who works in software integration, to study smarter and buy some of the tools he needed, including a laptop. He also sees the programme as a step towards professional registration and a brilliant networking opportunity. "It's the support network behind it," he says. "You get to talk to people in different locations, working in different sectors of engineering, who have probably worked abroad. It's kind of like a mentoring network." Bhogal thinks that while the world has changed dramatically since Sir Joseph Whitworth was alive, many of the industry's problems remain. He calls it "different but the same". Software may have replaced hardware, but core issues are still being confronted and the role of engineers is still to look to the future and find solutions. Bhogal says those considering applying for a Whitworth Scholarship should not hesitate. "One of my philosophies is to never say no," he explains. "If you're given an opportunity, always go for it. Say yes as much as you can. Get involved as much as you can. It's a great support network and it helps you develop an understanding of the industry." 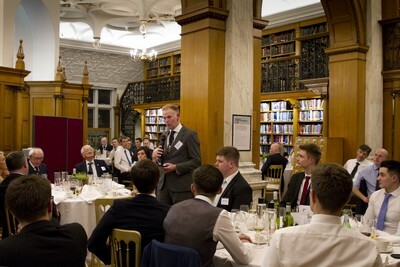 On Friday, 16th March, 60 Whitworth Scholars, and honoured guests, met in the Library of the IMechE for dinner to commemorate 150 years of Whitworth Scholarships. Scholars in attendance included the most recent 2017 Award Holders and Senior Scholars Prof. Francis Burrows Wh.F. (1953) and Dr Michael Wood Wh.S.Sch. (1953), plus former Whitworth Awards Committee Chair, Geoffrey Ward Wh.Sch. (1955). 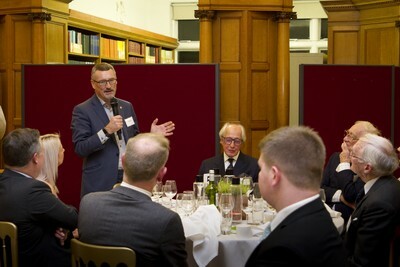 The structure of the evening included a speech from Jon Hilton, former President of the IMechE, covering his career in engine design, Formula 1 and regenerative power systems. Toasts were also made to the Queen, new Whitworth Award Holders and to the health of the Society, these are traditions that go back to 1923, when the Society was formed by Dr Hele-Shaw, former president of the IMechE. Current president of the Society, Dr Howard Stone Wh.Sch. (2002), spoke about the Commemoration letter to the Prime Minister Mrs Theresa May, supporting press release and introduction of the hashtag #Whitworth150 to commemorate this special year for all Whitworth Scholars. He also reminded the dinner guests of the audio interviews and videos with eminent Scholars that can be found on the Society website. Press resources for the Commemoration letter and interviews are available on the following page. The February 2018 edition of Professional Engineer features an interview with the current President Howard Stone where he discusses the legacy of Sir Joseph Whitworth and the Whitworth Awards Scheme.